Black Rainbow Obsidian gemstone Pendant, wire wrapped with sterling silver wire. These stones have a very subtle shimmer and colour to them when in the light, giving a slightly different take on the pure black stone. The necklace been made using an 8mm gemstone bead, on an 18 inch trace chain in Sterling Silver. If you are unsure of sizes please check against a ruler! All lead and nickel free! 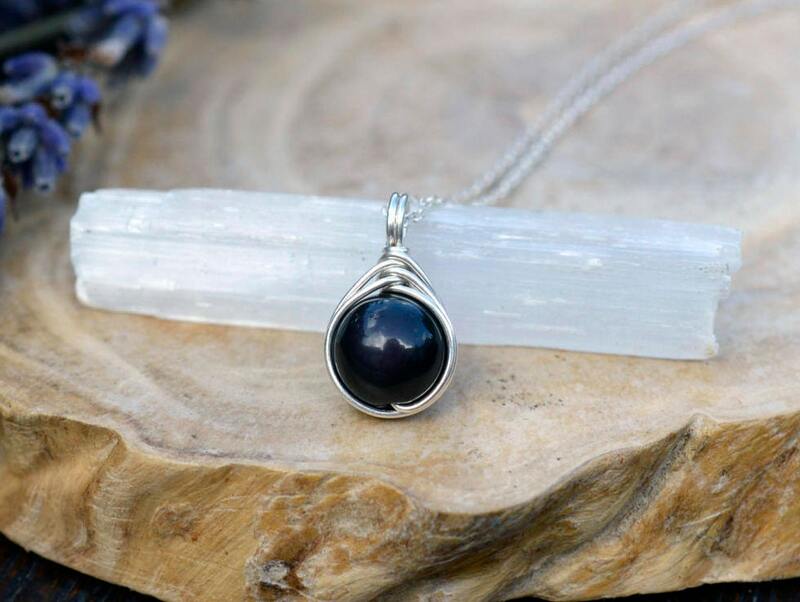 Obsidian helps to protect the very sensitive against depression. It is the stone of the soft hearted and gentle people of the world. 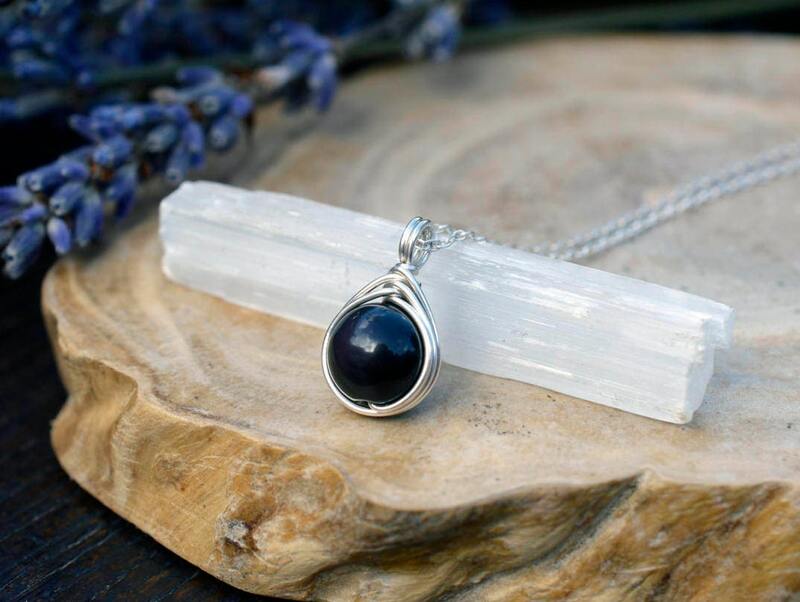 Use obsidian to help block negativity of any kind. As a black gemstone, it symbolizes self control and resilience. Black stones have protective energies in the sense that black is the absence of light, and therefore, can be used to create invisibility. Rainbow Obsidian is a natural volcanic glass with a variety of colors showing within it. is called a "stone of pleasure" because one of its most notable attributes metaphysically is bringing pleasure, enjoyment and joy to one's life. It also brings love and light to one and can bring out the Spiritual. Rainbow Obsidian is used psychically to enhance clairvoyance and is an excellent scrying stone, especially in the areas of love, relationships and self-development. It is also a very protective stone, and is especially effective in protection rituals and amulets, where it works by grounding out negativity to let light in. Thus, it is also a very grounding and centering stone. Rainbow Obsidian is primarily associated with the root chakra. Some items may take longer - please see "Shipping and Policies" tab for more information. UK orders are sent first class, and International orders sent with a Royal Mail tracked service. How long will my order take to arrive if I'm not in the UK? International shipping can vary based on the country, all of my parcels are sent via Royal Mail Airmail, and then are subject to customs in your country. All international orders are sent using a tracked international service for a small amount more, and this will arrive much quicker and you can monitor your parcel on it's journey to you. This is estimated to take between 5 and 7 working days to the USA but again is subject to customs within your country. Items from my shop come in a recycled eco card gift box with The Ivy Bee logo on it, in a cardboard shipping box that will fit straight into your letter box - no waiting in for the postman! If you purchase a larger number of items then the packaging will be larger and require a signature. Multiple items will be packaged together unless otherwise specified (e.g. a matching earring and necklace will be in the same gift box). I do not include receipts or information about the stones you ordered as standard. Ring sizing can be tricky! I make to both UK and US sizes. All of my listings are set to UK sizes but I have an option at the top of the drop down list to select and leave a note with your order if you want a US size. If in doubt it is a good idea to go to a local jeweler and get them to size you up. Once I have made the ring to size, if you have chosen the incorrect size and wish to have it resized that is fine - I will however ask for a small fee to cover the return postage and fees. This amounts to £5 for UK buyers and £10 worldwide (if you wish to use standard shipping). Please contact me if you have any issues! Processing times: Usually 3-5 Days, depending on the item! Some items may take longer, especially if they require sending off for hallmarking. Each of my items are made by hand to order, even down to putting in boxes and taking to the post office. This means that your order can take between 3 and 5 working days to dispatch, sometimes it is sooner! If you need an items urgently please contact me and I can try to accommodate your request. 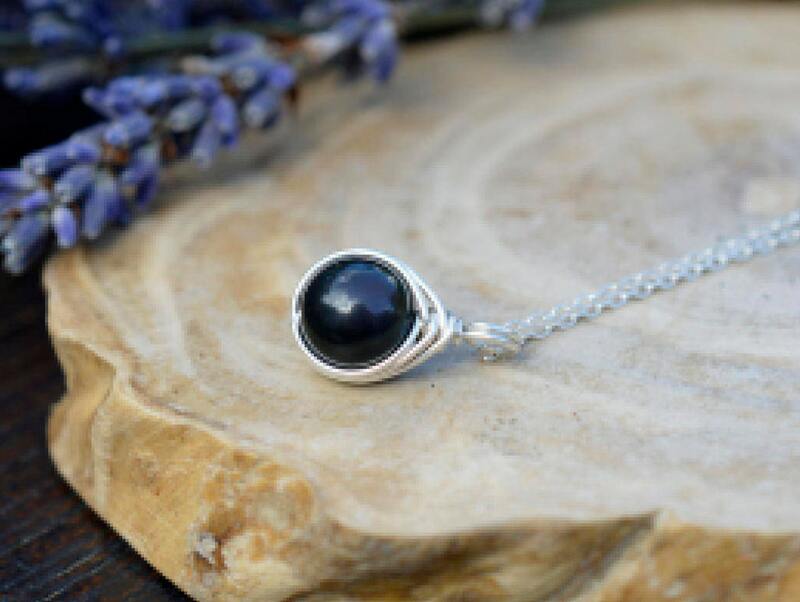 I do not accept returns on most items, as they are all made to your specific order with a few exceptions such as the larger wire wrapped pendants or if there is a fault with your item. Returns are not accepted on custom orders, but any accepted returns NEED TO BE IN THE ORIGINAL PACKAGING. This is especially important when returning from international countries outside of the EU - make sure that the customs declaration makes it clear that you are returning an item - I can not be responsible for any customs charges incurred and your refund will be either refused or the customs charge taken from your return. If the outer box is too damaged to return this is fine, just make sure that the original gift box is included in your return! Can I get my ring Resized? Of course! Resizing is £5 for UK orders, with free shipping. International orders are subject to a shipping fee. Please contact me for wholesale availability and any reselling inquiries. Reselling without prior notice and without the original branded packaging is not permitted. Adore!!! 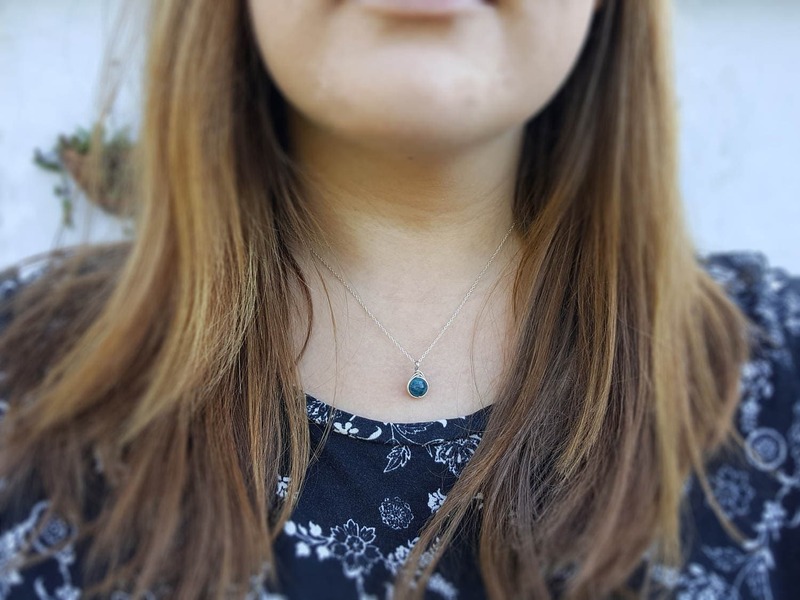 Very quick postage - so very happy with my necklace!!! Beautiful necklace! Even better than I expected! Fantastic craftsmanship! Terrific vendor to work with! Fast Shipping! Thank You!